The Land & Water Conservation Fund is Saved! One of America's best conservation programs is restored after Congress overwhelmingly passes a historic public lands package. On March 12th, President Trump signed a public lands bill into law that restores the Land and Water Conservation Fund (LWCF) and permanantly adds 1.3 million acres of wildnerness. The bill was passed by large majorities in both the Senate and House reflecting unusual bipartisanship in Washington D.C. By reauthorizing the LWCF, Congress saved one of our nation’s most important conservation programs, which expired last fall after 50 years of successfully protecting public lands and waters. For those of us who love the coast, the reauthorization of the Land and Water Conservation Fund is a big deal. The LWCF has protected countless coastal places, including San Onofre State Beach in California, Padre Island National Seashore in Texas and Lake Worth Pier in Florida. Such efforts not only benefit the millions of Americans that visit the shore, they also support our nation's ocean recreation and tourism economy valued at over $115 billion per year. Moreover, the benefits to recreational users do not end at the coast. An estimated 99% of U.S. counties from all 50 states have received funds from the Land and Water Conservation Fund, meaning that wherever you live in the U.S. there are local opportunities for outdoor recreation. From the acquisition of new public lands and waters to the maintenance of trails and visitor amenities, the LWCF is truly a boon for all of us who love the outdoors. To learn more about the recreational benefits of the fund, check out this cool storymap from the Outdoor Alliance. Unfortunately, the promise of the LWCF has been increasingly neglected in recent years as Congress has diverted billions of dollars of LWCF funding to use for other federal spending priorities. 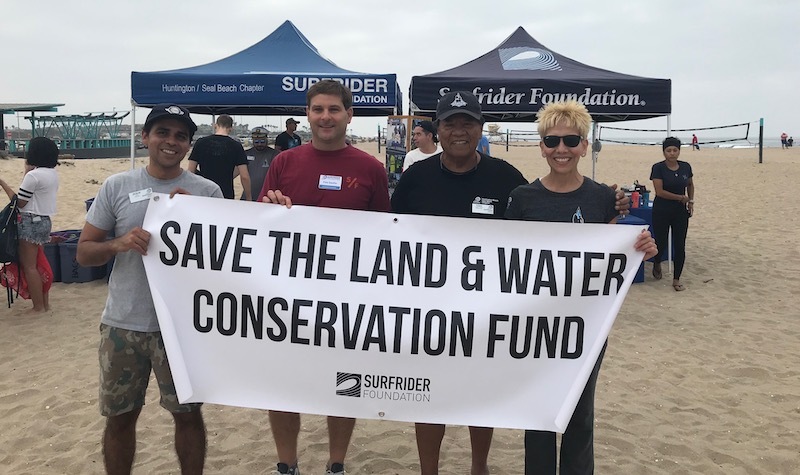 For these reasons, Surfrider and our partners will continue to advocate for permanent funding for the LWCF so it's protected from the whims of the annual budget appropriations process. The Surfrider Foundation joined the Outdoor Alliance and many other organizations in advocating for the public lands bill. In addition to restoring the LWCF, the legislation expands Death Valley and Joshua Tree national parks, protects Yellowstone and North Cascasdes from adjacent mining, and creates a national monument honoring civil rights icon Medgar Evers in Mississippi. It’s the largest public lands bill in a decade, and the overwhelming support from both parties shows the voice of the recreation community is growing! Thanks to everyone who contacted their federal representatives in support!